I'm emotional about this post and it really means a lot to me. I need to share some things in my world that are really impacting me as of late. A special friend of mine did the most selfless, loving thing today, she had a baby girl and gave her to her new adoptive parents. I can't imagine how she must feel and I am so proud of her. I also have a dear friend who is preparing to adopt two Ethiopian children. My goal for the next little bit is to do all that I can to help this sweet couple raise money to adopt these children. If any of you think you could help, please do. Roger and Melissa have a blog where they are telling us all about the process and letting us celebrate this special time with them. Melissa and her sister Bonnie just opened up an Etsy shop called An Artists Garden where they are selling the most adorable hair ornaments. These are the one's that I have been sporting around town and I am in love with them. They are made with love and the money will go towards the adoption fund. They are also gift wrapped and make lovely presents. You'll be seeing a lot more on the blog here about Roger and Melissa in the next couple of weeks. We are planning a big shin-dig and I am super excited about it. 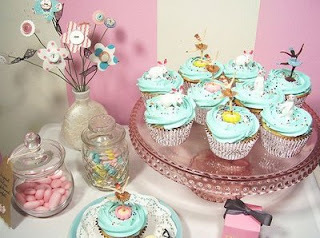 The photo above is my inspiration photo for the cupcake table. Cute hair thingies...I'll have to go check out the Etsy shop. I cannot even imagine - what a blessing for that family and what a selfless thing to do for that woman to give her child a perfect home. What an amazing adventure they are about to have. I wish them the best of luck. When my parents lived in Mozambique they had a street kid who was 9 come to their house almost everyday and I wanted to adopt him so bad, they even gave him a picture of me and he called me his american mom. I could go on but this is a comment so I won't. I got your cute thank you card today, I love that picture, so Ryan and I, I'm going to have to frame it. I'm keeping my hopes up for sure on some goodness to come. You are a great friend. I will be thinking of both of your friends---and I'll check out the etsy shop.